MONTGOMERY, Ala. – Alabama’s governor on Thursday signed a tough new illegal immigration law that requires public schools to determine students’ immigration status and makes it a crime to knowingly give an illegal immigrant a ride. The bill also allows police to arrest anyone suspected of being an illegal immigrant if they’re stopped for any other reason. Alabama employers also are now required to use a federal system called E-Verify to determine if new workers are in the country legally. Gov. Robert Bentley said the law is the nation’s toughest, and groups including the American Civil Liberties Union and the Montgomery-based Southern Poverty Law Center agree. The groups say they plan to challenge it. The legal director for the Southern Poverty Law Center, Mary Bauer, said Thursday that she expects a lawsuit to be filed before the provisions of law are scheduled to take effect on Sept. 1. “It is clearly unconstitutional. It’s mean-spirited, racist and we think a court will enjoin it,” Bauer said. Sam Brooks of the SPLC’s Immigrant Justice Project said the new law will set back progress Alabama has made on civil rights and race relations. He also said it would be costly for the state to enforce and defend the provisions of the law. According to the 2010 U.S. census, 3.9 percent — about 186,000 — of the state’s nearly 4.8 million people identified as Hispanic or Latino. That’s more than double the number reported in the 2000 census. One of the sponsors, Republican Sen. Scott Beason of Gardendale said the legislation would create jobs and put unemployed Alabama residents back to work. “This will put thousands of Alabamians back in the workforce,” Beason said. But Jared Shepherd, an attorney for the ACLU, said he doesn’t believe the new law has anything to do with jobs. “This is about trying to put anti-immigration sentiment into law,” Shepherd said. He said the ACLU would join the SPLC and other groups in challenging the law in court. He said he finds the provisions requiring schools to document the immigration status of students to be particularly troublesome. He said he is concerned that immigrant parents will not send their children to school out of fear that they will be arrested because of their immigration status. Public schools will not be able to deny illegal immigrants an education, however. 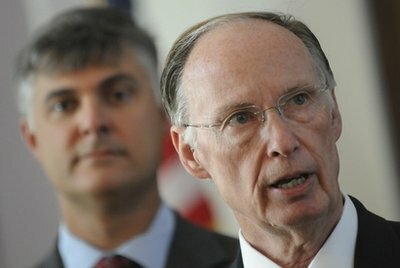 Bentley said the bill was intended to get data about how many illegal immigrants attend public schools. Bentley, who campaigned on passing the toughest anti-illegal immigration bill possible, said he believes the measure can withstand legal challenges. The House sponsor, Republican Rep. Micky Hammon of Decatur, said the bill was written so that if any part of it is determined to be unconstitutional or violate federal law, the rest will stand. Alabama’s measure was modeled on a similar law passed in Arizona. A federal judge blocked the most controversial parts of Arizona’s law last year after the Justice Department sued. A federal appeals court judge upheld the decision, and Arizona Gov. Jan Brewer has said she plans to appeal to the U.S. Supreme Court. Neighboring Georgia also passed a law cracking down on immigration this year, and civil liberties groups have filed a lawsuit trying to block it. Linton Joaquin, general counsel for the National Immigration Law Center in Los Angeles, said the Alabama law stands out over other states because it covers all parts of an immigrant’s life. “It is a sweeping attack on immigrants and people of color in general. It adds restrictions on education, housing and other areas. It is a very broad attack. The state does not have the right to create its own immigration regime,” Joaquin said. He said his organization plans to be involved in lawsuits challenging the new law. He said the organization is involved in challenges in Utah, Arizona, Indiana and Georgia.